Twenty-third Planned Parenthood medical emergency in five months makes defunding Planned Parenthood an urgent necessity. 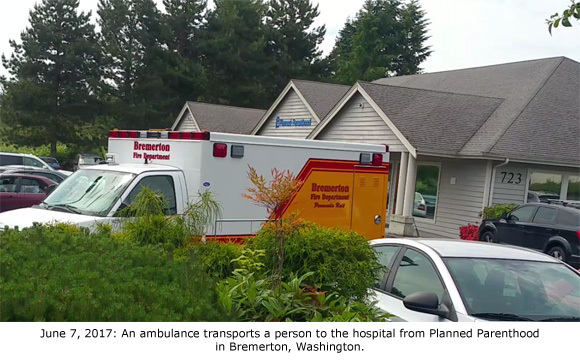 Bremerton, WA – As a man and a very young girl paced in the parking lot of a Planned Parenthood abortion facility in Bremerton, Washington, two ambulances and a fire unit responded to a medical emergency that appeared to involve their loved one. This represents the 23rd time an ambulance has been spotted outside a Planned Parenthood center this year. Video of the incident was taken on June 7, 2017, by Laurie Coykendall, leader of the Bremerton area chapter of Sidewalk Advocates for Life, who provided it to Operation Rescue. A fire unit was already on the scene when the first ambulance crew arrived and took a gurney into Planned Parenthood. A short time later, they came out with the empty gurney. 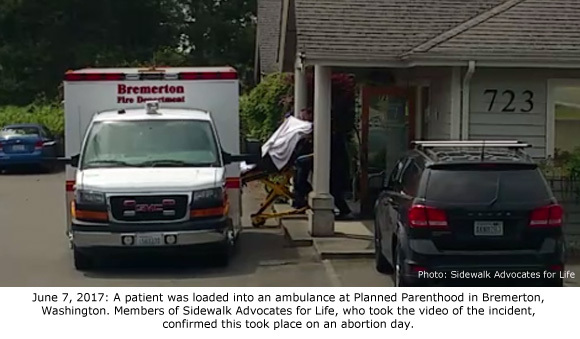 Soon, a second ambulance manned by paramedics arrived and entered Planned Parenthood. It is believed that the first ambulance was only equipped for “Basic Life Support.” The second ambulance of paramedics would have been equipped with “Advanced Life Support” capabilities, indicating the patient’s situation may have been more serious than expected. When the emergency responders began to interact with the man and young girl, it became apparent that the woman involved in the medical emergency was somehow related to them. The woman was taken out of the Planned Parenthood facility on a gurney completely covered with a sheet. The man and the little girl followed the ambulance in a private vehicle when it left Planned Parenthood.